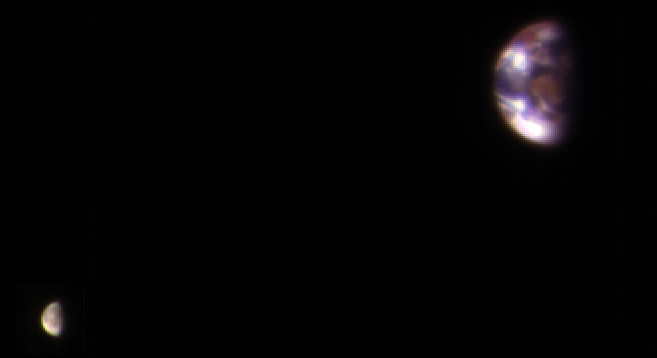 This image composite combines the best Earth image (ESP_048368_9041) with the best Moon image (ESP_048368_9044) from four sets of images acquired on 20 November 2016. Each is separately processed prior to combining (in correct relative positions and sizes), so that the Moon is bright enough to see. The Moon is much darker than Earth and would barely show up at all if shown at the same brightness scale as Earth. Because of this brightness difference, the Earth images are saturated in the best Moon images, and the Moon is very faint in the best (unsaturated) Earth image. The image color bandpasses are infrared, red, and blue-green, displayed as red, green, and blue, respectively. This is similar to Landsat images in which vegetation appears red. The reddish blob in the middle of the Earth image is Australia, with southeast Asia forming the reddish area (vegetation) near the top; Antarctica is the bright blob at bottom-left. Other bright areas are clouds. We see the western near-side of the Moon. These images were acquired for calibration of HiRISE data, since the spectral reflectance of the Moon’s near side is very well known.